Tag Archive | "historical horror"
The Queen of Crows is Now Available for Your Kindle, Nook, iPad and More! First published in March 2010 on DriveThruHorror.com, we’ve expanded our digital offering to include a text-based version for your Amazon Kindle or your Nook from Barnes and Noble. Since this file format is primarily text-based, we went ahead and dropped the price to $2.99 on both the Kindle and the ePub edition. The ePub format, which is available at Barnes and Noble, is also compatible with several other devices including your Sony eReader and your iPhone. Both the Kindle and ePub format are also available through DriveThruHorror.com for your convenience. Earlier this year, FlamesRising.com announced the release of an e-book by Monica Valentinelli, Shari Hill and Leanne Buckley entitled THE QUEEN OF CROWS. Since its release on DriveThruHorror.com, this $4.99 e-book has gotten rave reviews for its unique design and strong emphasis on the reader. Today, we are pleased to announce that a promotional trailer has been released for THE QUEEN OF CROWS. The trailer was designed by Monica Valentinelli and employs an aged, historical feel. The music was composed by James Semple, a professional in the entertainment industry. Together, the pair worked on deciding the feel of the music and how it fit with the dark images in the trailer. Once the theme of the music was decided, Semple worked his magic and incorporated sound effects into the dramatic clip. FlamesRising.com is pleased to present you with the design notes for THE QUEEN OF CROWS, which is available at DriveThruHorror.com. This unique e-book was designed by Monica Valentinelli. In addition to her work here at FlamesRising.com, Monica is also an author and game designer who specializes in the horror and dark fantasy genres. For more information about this project, be sure to visit VioletWar.com or Monica’s blog located at www.mlvwrites.com. Just before I received this comic, I read Abraham Lincoln: Vampire Hunter. In that book, history gets turned every slightly, so that readers can be treated to a vision of the Sixteenth President. It’s a fun game to play, which is evident by the flood of books related to this genre. Comics, however, get to reveal Paul Revere’s secret story. His story proves equally fun. 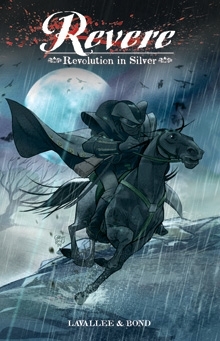 Grant Bond’s artwork in Revere: Revolution in Silver is, for lack of a better word, wicked. His splash pages along with the sketchbook at the end of the book show an incredible range of style. He often crafted two-page splashes with incredible effect. The colors are mostly dark (red is used for blood and the British mainly). Lots of grays and blacks fill this book; however, it looks vibrant. Ex Occultus is a globetrotting, serialized epic combining elements of Indiana Jones, H. P. Lovecraft and The X-Files as it follows the exploits of adventurer and fortune-hunter Francis Wakefield, the gruff and grizzled Englishman with a tortuous past, and his protégé, a young man only known as Hollander, as they journey through the arcane in search of treasures and fortune, righting wrongs as they go. 1874. Sofia, Bulgaria. Wakefield and Hollander are hired by a mysterious nobleman to track down the fabled Seal of Solomon, a ring of supernatural origin with the abilities to summon and control demons. What first appears to be a simple mission, however, soon becomes something far more deadly. Ex Occultus: Seal of Solomon is available at DriveThruComics.com. The Introduction opens with the comment that while there’s plenty been published about the Adversary, precious little has been produced – bar the core rules – to support Witch Hunters themselves. This book sets out to change all that, a tome designed to aid Witch Hunter characters, honing them into potent and effective forces for good. To put things in context, there’s a brief summary of the way things are – the war between the supernatural and the protectors of mankind, the Orders of Solomon and their operatives the Witch Hunters. A war now waged in secret, although once, in times of legend, more open. The Queen of Crows is available now at DriveThruHorror! Centered around a short story entitled “The Queen Of Crows,” this unique product was designed by author and game designer Monica Valentinelli. 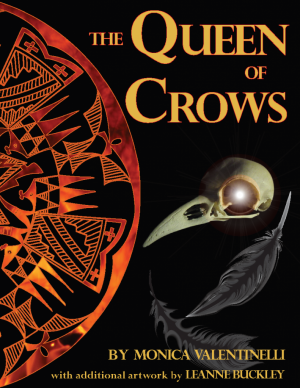 At a retail price of $4.99, readers will receive a magazine-style layout of THE QUEEN OF CROWS, a professional illustration of Mahochepi and more! This product is the first digital release set in the world of the Violet War and is also the first fiction product published through Flames Rising Press. The short story, which is entitled “The Queen of Crows,” takes place during the 1860s and focuses on the tough decisions that a Navajo elder named “Tse” must make to save his people. Will he summon Mahochepi, the Queen of Crows, without knowing who–or what–she is? Read the story and find out! 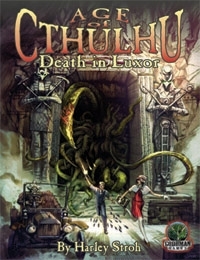 Goodman Games has a new Age of Cthulhu series, which starts with Death in Luxor. Set in 1924, this adventure centers around a group of investigators as they explore a murder/suicide and the events that could have provided the catalyst for the violence. This adventure comes in at exactly fifty pages (including cover art) and, due to its structure, is a hefty read. The author, Harley Stroh, also directed the game’s art, which is one of its strongest features. The cover art provided by Eddie Sharam depicts the adventure’s more Sanity-blowing moments and is, quite simply, one of the better cover pieces I’ve seen in ages. Like the origin of the number 666 in our pop culture, Halloween conjures claims that it’s a satanic, violent holiday. Horror movies like the Halloween series with Michael Myers have fictionalized this view for decades. Recently, Rob Zombie offered his version of the Halloween remake review which happened almost thirty years after the Halloween movie debuted in 1978. With many myths and urban legends circulating about the safety of Halloween night — you may remember your parents warning you about the razor blade in the apple — is it any wonder that in some circles Halloween has gotten a bad rap? As the ancient Seal of Solomon has slowly faded over millennia, more denizens of the Invisible World slip once again into the world of man. Only the gifted ranks of Witch Hunters, amazing mortals that stand against the forces of the Adversary, are equipped to face terrors beyond mortal ken. This invaluable guide to the fearsome monsters of the Invisible World provides everything needed by the Grand Masters to challenge cadres of intrepid Witch Hunters with the foulest minions of the Adversary. The Grand Tome of Adversaries is available at the Flames Rising RPGNow Shop. Filmed on location in gorgeous Marin County, California, The Beckoning is an independent horror film based on the legend of Sir Francis Drake. In 1579, Sir Drake landed in California, claiming the land as “Nova Albion” or “New White.” The story of the film is a look at a legend surrounding this historical figure; Drake’s burning of a Native American woman at the stake for setting a pox upon Natives and English alike. 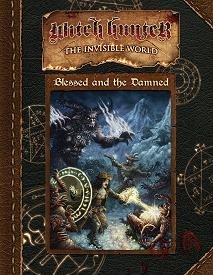 An adventure book for the Savage World of Solomon Kane RPG. Beware traveler, for many roads lead to Hell! Evil cloaked in many forms holds sway across the world. Facing it is a small group of stout-hearted men and women, wanderers all, called by a powerful shaman to follow the Path of Kane. Traveler’s Tales comprises three short adventures for the Savage World of Solomon Kane RPG. Each tale of horror is standalone, allowing it be easily inserted into any campaign. 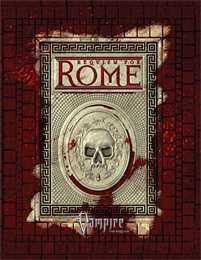 Requiem for Rome is a historical supplement and setting for Vampire: the Requiem from White Wolf Publishing, much like Dark Ages: Vampire was a historical setting for Vampire: the Masquerade. Requiem for Rome is a beautiful, but dark, book full of cunning aristocrats, noble savages and mysterious monsters. It is a 260 page hardcover (or eBook) filled with history, rumor and legend. Ken Hite’s Foreward, The Deathless City, sets the mood immediately with a look at the history, secrets and terrors of Rome. Any Storyteller should be able to gather more than a few ideas from this section of the book alone. It is definitely worth the read if you get the chance. Ages ago, when the Ghosts of Albion RPG was first announced by the folks at Eden Studios we were pretty fired up about the idea of some new Cinematic Unisystem elements. We managed to land interviews with both Amber Benson and Christopher Golden, asking them about the game and other related products. The energetic Timothy S. Brannan wrote a review of Accursed (a Ghosts of Albion fiction novel) that helped explore the setting just a bit more. Well, Eden Studios hit a few delays and it took them a bit to get their house in order. However, the wait was certainly worth it. Ghosts of Albion is now available and it is a pretty awesome looking game. 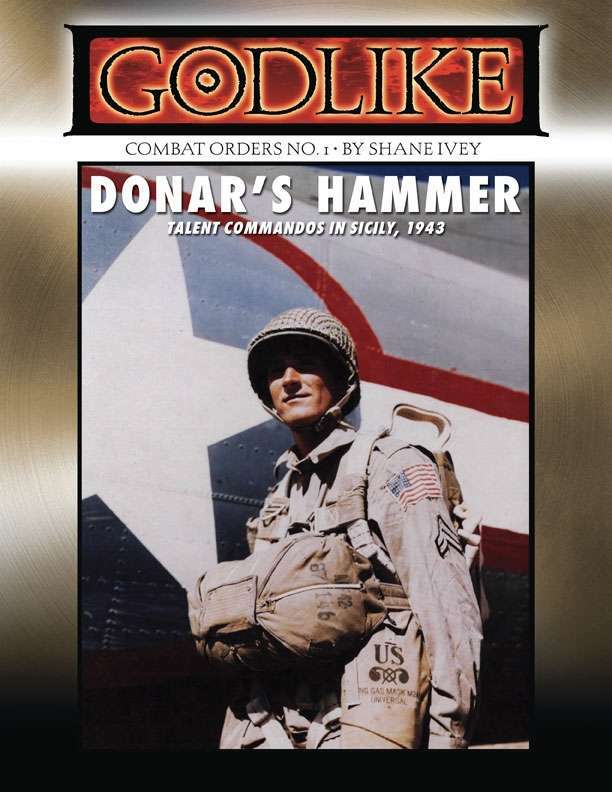 “Donar’s Hammer” is the first of the smaller supplements for “Godlike” RPG, and provides an introductory scenarios as well as optional rules for your “Godlike” game. Set in Sicily in 1943, players take on the role of a group of Allied Talents that come face to face with a group of Axis Overmen protecting a talent called Mjollnir, the name of the norse god Thor’s mythic hammer. What begins as a simple seek-and-destroy mission instead becomes a fight for survival and the soul of a small town. “Godlike” is a role-playing game about super heroes during World War II. But “Godlike” isn’t your normal super-powered game. The heroes, called Talents, are normal people with extraordinary powers, but who ultimately are still very human. The Talents in “Godlike” don’t dress in spandex and capes while soaring into war. That’s like wearing a giant target on your back. Instead Talents tend to work in small groups, just like a regular military unit, and conceal their extraordinary abilities when possible. The Talents have great power, but ultimately are tools in the war, and a player character’s ability to affect the course of the war is limited and dependant more upon the success of missions rather than just on personal actions.